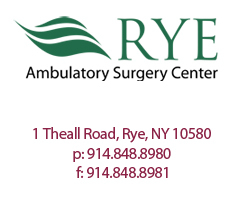 The Rye Ambulatory Surgery Center (Rye ASC) is a modern healthcare facility, located in Rye NY, focused on providing superior outpatient surgical care to patients without requiring admission to a hospital or other facility. The goal of the entire medical team at the Rye ASC is to perform high quality surgical procedures for our patients in a comfortable, compassionate, and professional environment. Our state of the art facility is licensed by the State of New York, certified by Medicare, and accredited by the Association for Ambulatory Health Care (AAAHC), demonstrating our commitment to providing patients with the highest standards in care. Services offered at the Rye ASC include anesthesiology, bariatric surgery, breast surgery, colorectal surgery, general surgery, gynecologic surgery, ophthalmology, orthopedics, plastic surgery, podiatric surgery, urologic surgery and vascular surgery. Click here to learn more about the Rye ASC Leadership.